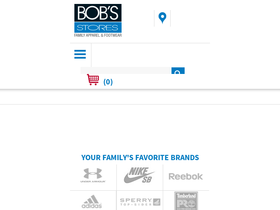 Bob's Stores, online at bobstores.com, is the destination for family apparel at a great price. Bob's Stores carry many big brand names including Nike, Levi's, New Balance, Adidas, Champion, Dickies, Timberland, and more. Not only does Bob's Stores have huge deals on everyday clothing, but they also offer huge savings on footwear, workwear, and teamwear. Bob's Stores have over 30 stores across the northeast, but they also offer great discounts online at bobstores.com. Check out RetailSteal.com for all the latest bobstores.com discounts, bobstores.com coupon codes, and bobstores.com promo codes. Use this promo code at bobstores.com and save $50 when you spend $150 or more. Shop at bobstores.com and save 30% off on apparel when using this promo code at checkout. Shop online at Bob's Stores and save $20 off $100+ with this coupon code. Shop at bobstores.com and save $10 when you spend $50 or more. Exclusions apply. Save 25% on your Bob's Stores footwear purchase when you enter this coupon code at checkout! Spend $48 or more at bobstores.com and enjoy free shipping on your order.